The Awakening - Arm | Flickr - Photo Sharing! 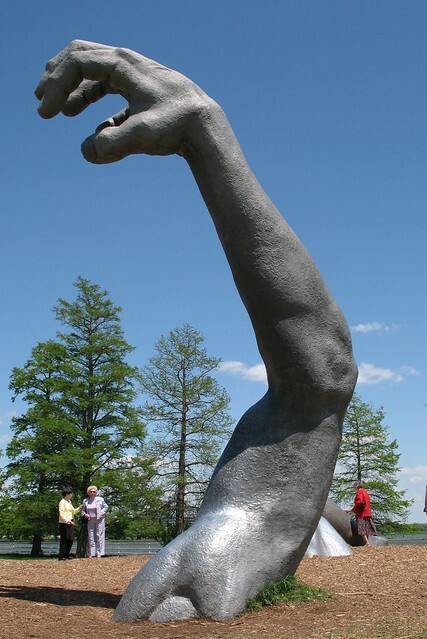 The Awakening, a massive sculpture by J. Seward Johnson, of a giant struggling to emerge from the ground. It has been located on Hains Point in East Potomac Park, the southernmost point of DC, since 1980. It has recently been bought by a developer, who will soon move it to a location in Maryland. I thought I'd better take some pics before that happens. Detail of muscular arm. Update: As of February 20, 2008, the sculpture has been removed from the site, and relocated to an arguably less-charming site at National Harbor, the new hotel, convention and retail complex in Prince George's County, MD. Nice angle. I see the muscles on the arm.